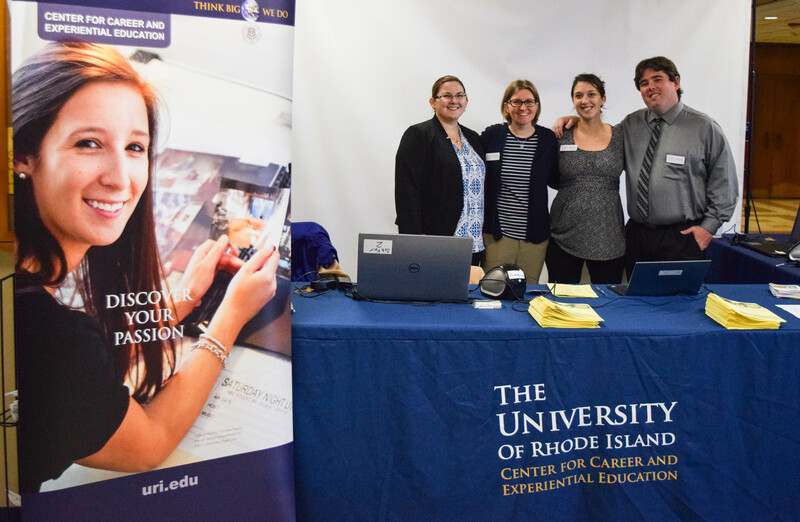 Photo by Anna Meassick | (Left to Right) Event Coordinator Kelly Harris, CES specialists Lisa Kuosmanen, Caitlin Broccoli and Douglas Ouimette welcome students to the Fall Networking and Career Fair. Professional Development Week (PDW) is in full swing at the University of Rhode Island, with students and employers descending upon the Memorial Union all week long. 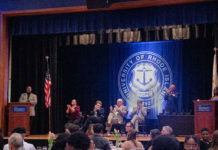 The URI Career Center puts on the event every year, hoping to give students as many benefits as possible. Ashley Foley, a Career Education Specialist at the Career Center who helped to organize the event, spoke at length about what the benefits of attending PDW are. “To help you be prepared for your job and your internship search, be prepared to enter the workforce and give you those tools you need to succeed, and that’s the whole goal for the week,” said Foley. The week has had many standout events already, such as a fashion show on Monday. The show focused on professional dress, showing students what the professional world looks like. On Wednesday the Rainville Ballroom was filled with students hoping to get into the Career Fair. One of the most anticipated events of the week had scores of employers for students to come and network with. “Forty-five-50 employers and they’re across all majors so it’s not for just one student,” said Foley. PDW will continue through Friday with even more events open to students to prepare them for after college.